September 14, 2009 | Comments (0) | by T.R. First off, welcome back to the NFL. We missed you greatly. NFL Division Matchups in Week 1: Does anyone else think that it might not be the best idea to play divisional rivals during the first week of the season? By it's nature, we witness quite a bit of rust during Week 1, as most starters do not play in the last pre-season game, and new players have yet to fully click with their teammates and gameplans. I do not mean this as an excuse for poor opening game performances, but I think it is a fair argument. For example, the Bears and Packers both looked like they were working out kinks on offense last night. If the Bears are going to have a game scheduled with a non-conference opponent like the Bengals, why not slot that in for the first week of the season, instead of an important game with a divisional foe? It would allow the players a full game to get their sea legs under them, and potential tie-breaker scenarios at the end of the season would not be dictated by what is often a less than stellar first game. Logistically, the NFL schedule is not nearly as difficult to piece together as the MLB schedule. I do not see a logical reason as to why non-conference teams, or at the very least teams outside of your division, cannot be scheduled for Week 1. Pepsi's "Forever Young" Commercial: This commercial, featuring Bob Dylan's "Forever Young" as sung by some rapper named William, was first introduced to us during last February's Superbowl. Early this spring, in a shrewd bit of advertising, Pepsi spliced old baseball footage into the commercial and aired it on a near-continuous loop on the Major League Baseball network, amongst other stations. After six months of bombardment, the first notes of the song have come to elicit anger, hitting, and the throwing of various objects in the Brown household (mostly by Mrs. Brown). But hey, baseball season is drawing to a close, so the commercial will soon go quietly into that good night, right? Apparently not. A revamped version came on during the Steelers/Titans game, naturally with old football footage taking the place of baseball. This could quickly surpass John Mellencamp's "Our Country" song for Chevy as the most painful ad campaign ever. Anthony Bourdain's Lack of Traveling: If you watch "Anthony Bourdain: No Reservations", you'll likely have noticed that the overwhelming majority of episodes this season take place in the United States. I'd like to give the Travel Channel the benefit of the doubt here. Perhaps Bourdain just wants to stay closer to home for a while. What I really hope is that the Travel Channel isn't citing the recent economic downturn as their reason for keeping Bourdain in the states. Maybe they don't have the budget of recent years, but if they indeed have chosen to ground Bourdain in favor of such one trick ponies as Andrew Zimmern and "Bite Me with Dr. Mike", then we are all being cheated. Bourdain actually brings something intellectual and personal to the table, two qualities which are increasingly lacking in our short attention span, shock value television of late. 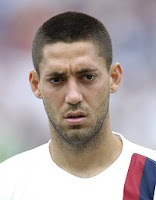 Clint Dempsey (American soccer player): Please help me out here Clint. You make me so sad when I watch you play soccer. Are you going for the "Sigourney Weaver in Alien 3" look, or the "two days out of Auschwitz" look? For the love of God man, eat something; smile on occasion; grow your hair back out a half-inch. Please pretend that you're happy and love your job, because this could very well be a pivotal year for American soccer. So many impressionable kids are looking up to you. The FOX Robot: Countless blogs and commenters have chided FOX for their idiotic graphic robot (you know which one I'm talking about). Many of us were secretly praying that the network would finally ditch this gimmick for the 2009 season. I didn't even want to mention it to my friends over the last few weeks for fear of jinxing it. Alas, they did not scrap the damn robot. I suppose you can give FOX kudos for their conviction, though we would rather that you did not. A Non-Rant: I despise USC football. I'm a Big Ten guy by nature, and living in Southern California, I am tired of all the USC ball-washing. That being said, I am fairly interested in the Mark Sanchez-led Jets. I suspect that they will be on television quite a few times in our region, and I vow to maintain an interest in how they fare.